Join us as we celebrate Greater Fort Lauderdale’s top restaurants, chefs and cuisine and indulge in the area’s hottest culinary experiences. 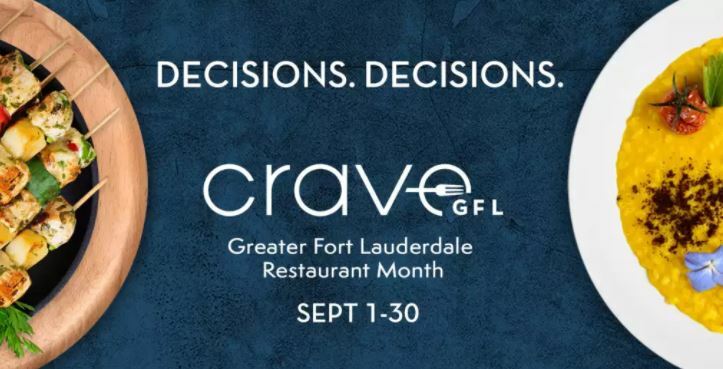 Enjoy specially-created three-course gourmet dinner menus for $37 during Crave GFL Restaurant Month. Discover the mouthwatering ingredients that make dining here so extraordinary. Throughout September, each Crave GFL restaurant will host a “culinary experience” from a wine-pairing dinner, a chef-demonstration to a cooking class or mixology class. You’re sure to enjoy the eclectic blend of culinary delights found in Greater Fort Lauderdale. Click here to view a list of restaurants! Click here to find a calendar of culinary events!